July 4, 2015 Update: Adding this “Made in the USA” label lingo literacy from Consumer Reports to remind us all of our increasingly interdependent global culture and fascinating glimpse of whether the flag-waving zeal and patriotic pride merits a “made elsewhere” second glance. Here’s to a peaceful celebration of independence, and thankfulness for the freedoms we all too often take for granted. 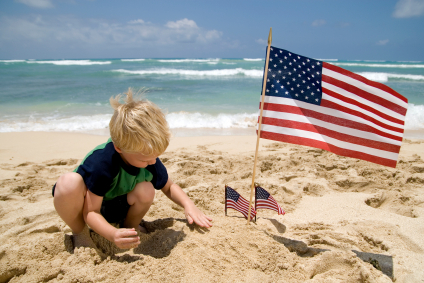 Original Post, 5-yr flashback: Amidst the fireworks, flag-waving and requisite BBQs, fun relay games and Fourth of July activities for kids, it would serve us all well to remember what we’re celebrating on “America’s Berfday,”as one toddler gleefully exclaimed to me with his drippy ice-cream belly spilling into his swim trunks. His response was age-perfect and sweet as can be, but I must say, every year when I run the field day games at our annual neighborhood karaoke and kidfest I get taken aback by some of the older kids’ responses to ‘trivia quiz’ answers…even when I purposely seed some “basic gimmes” about our Declaration of Independence and what’s going on in the world. Today in my ‘living lab’ of lawn games and field fun, I’ll see if LeapFrog means more than a digital toy, and if the quest for democracy or in the middle east translates to the precious concept of freedom and Independence Day among youth in the US. Should be interesting! Let’s just not forget the real meaning of independence and how lucky we are to have it. …”Toss in some factoids, a few arcane trivia stumpers and relevant history into the day, because somehow we need to remind children 4th of July is not just about blowing things up (much less winning prizes for the biggest bubble).” etc. etc. Other Fun Finds: Please Add Your Own!